Louise McIlroy was the first female in many medical posts. She was one of the first female medical graduates in Scotland; the first female resident at Glasgow Royal Infirmary, and went on to become house surgeon at the Glasgow Samaritan hospital and gynaecologist at the Royal Infirmary. She was also the first woman senior assistant to the Muirhead Professor of Obstetrics at the University. She had a distinguished war record as Medecin Chef at the Scottish Women’s Hospital, in France and later in Salonika and Serbia. She was awarded the Croix de Guerre and two Serbian medals. After the First World War, she became a consultant and Professor of Obstetrics and Gynaecology at the Royal Free Hospital in London and published extensively, notably a pioneering textbook The Toxaemias of Pregnancy. Created Dame of the British Empire in 1929 for services to midwifery, and became a founder fellow of the Royal College of Obstetricians and Gynaecologists. She was appointed to the General Council of the British Medical Association and was a Fellow of the Royal College of Physicians. Among other achievements, McIlroy was one of the first to insist on an anaesthetic in every maternity case, to do work on the resuscitation of the newborn, and, above all, to teach her students to avoid "meddlesome midwifery." Born 11 November 1874, County Antrim, Ireland. 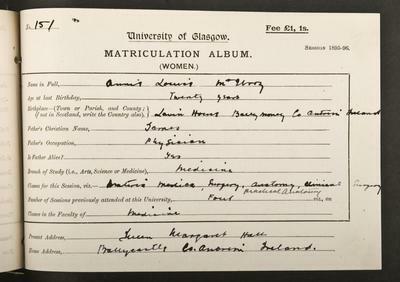 (Anne) Louise McIlroy (1874-1968) was the first woman to be awarded an MD by the University and the first woman to be officially registered as a research student there. She was awarded an honorary LLD by the University in 1935. McIlroy was born in County Antrim, the daughter of a general practitioner. She matriculated at the University in 1894 to study for a medical degree and won class prizes in both Medicine and Pathology before obtaining her MB ChB in 1898. She was awarded an MD with commendation in 1900. 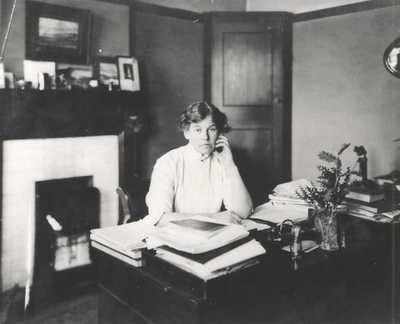 After further postgraduate work in Europe specialising in Gynaecology and Obstetrics, McIlroy was appointed Gynaecological Surgeon at the Victoria Infirmary in Glasgow, a post she held from 1906 to 1910, and was registered as a research student at the University. She served with distinction in the First World War and then returned for a short time to Glasgow. In 1921 she was appointed Professor of Obstetrics and Gynaecology at the London School of Medicine for Women and worked as a surgeon at the Marie Curie Hospital for Women. Her services to Midwifery were recognised in 1929 when she was appointed Dame of the British Empire. She retired in 1934 to have, in her own words "a few years of freedom". McIlroy felt strongly about doing her duty and when war was declared in 1939 she immediately offered her services. She organised emergency maternity services in Buckinghamshire and provided her own equipment and comforts at the hospital in the face of inevitable shortages. After the Second World War she returned to retirement, staying with her sister in Turnberry in Ayrshire. Jenkinson, Jacqueline. 2006. McIlroy, Anne Louise. In The Biographical Dictionary of Scottish Women. 225. Edinburgh: Edinburgh University Press. McIlroy, A. L. 1912. Some Experimental work upon the physiological function of the ovary. An International Journal of Obstetrics and Gynaecology. 22:1:19-26. McIlroy, A. L. 1924. From a balcony on the Bosphorus. London: Country Life. World Changing Project, "Leading obstetrician and gynaecologist," in University of Glasgow World Changing (University of Glasgow, 2010); http://www.worldchanging.glasgow.ac.uk/article/?id=96 (accessed April 26, 2019). World Changing Project. "Leading obstetrician and gynaecologist." In University of Glasgow World Changing. University of Glasgow, 2010. http://www.worldchanging.glasgow.ac.uk/article/?id=96 (accessed April 26, 2019). World Changing Project. "Leading obstetrician and gynaecologist." University of Glasgow World Changing. University of Glasgow, 2010. 26 April 2019 <http://www.worldchanging.glasgow.ac.uk/article/?id=96>.